Thank you for your recent inquiry. Noreen Renier appreciates your interest in her intuitive abilities. Although unable to guarantee the outcome of a given case, she can assure you of her best possible efforts during her consultation. Please understand that psychics do not solve crimes -- police do! The images or impressions she perceives could provide clues, new information, or perhaps a different angle to your unsolved crime. 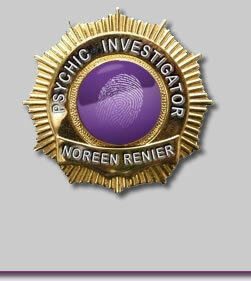 In effect, Noreen Renier's psychic skill serves as an investigative tool in the hands of law enforcement officers. From her 40 + years of service to the law enforcement community worldwide, she takes pride in numerous successes and accomplishments. The current fee for a psychic consultation with the police detective assigned to a case is $650.00. The session usually lasts approximately forty-five minutes to an hour.. A follow-up consultation should last 45 minutes to an hour at no charge if it is within 2 months of the original consultation. A forensic artist to sketch the key suspect often aids in their investigation. If the assigned detective is interested in working with Ms. Renier, please ask him to call her office to set up a time for an appointment on the phone. If you have any questions or need additional information, please do not hesitate to contact us at the numbers below. Let me reiterate that I do not solve crimes -- the police do. I merely serve as an aid or an investigative tool for the police. By picking up images and feelings undetectable by the untrained mind, I help provide clues, overlooked information, and perhaps a new angle to an unsolved crime. The first time a law enforcement officer or agency engages my psychic ability as an investigative tool, I stress certain important, but simple, techniques. Here's a summary of them, which when carefully applied can enhance my psychic abilities and (hopefully) lead to solving an unsolved case. 1. A psychic should be called into an investigation as a last resort, when traditional methods for solving a crime have been exhausted. 2. I prefer not to know any details or personal background of the victim or the crime, other than the victim's first name and the type of crime. The less you tell me, the more I'll be able to tell you. 3. I use an approach called psychometry, which is touching an object that the victim wore or the suspect left behind. 4. It is important to start slowly. Initially I try to see psychically what the victim looked like, or to recreate the scene of the crime. I do his for two reasons: to make sure I'm "tuning" in to the case, and to give the officer/agent confidence in me as a psychic. If this phase succeeds, we can continue with the case. 5. On the matter of questioning, I've found that one's quality of questions affects how well I produce the targeted information. So, I ask that my client -- the assigned detective -- come prepared for the session. Know in advance what your objectives are. Think of a profile you want me to fill in -- information you consider helpful for identifying and/or locating a suspect or body or weapon or key witness. 6. The phraseology of a question is critical to success. An inadequate way to question is: "Where does he (suspect) live?" Or: "Did he (suspect) do it?" The more productive approach seeks to evoke an image: "Stand in front of the house (body) and walk toward it, what do you see? Look to the right, to the left, fly above it, what do you see?" "Describe the suspect, etc." 7. Leading questions are unproductive; ones such as "Is his hair black?" "Was he driving a blue Ford?" Instead, let me describe him/her to you, as well as any other pertinent information. Questions should have directions and not merely need a "yes" or "no" answer. Helpful, too, is your feedback when you know I've accurately described something or someone. The logical mind can analyze, but the psychic mind just receives information. The feedback keeps my confidence up and the images flowing. "Yes, we understand," is sufficient. 8. Try to refrain from immediately analyzing the data I relay to you. I realize the difficulty here, but I view this part of the session as "raw fact"- gathering. Extract as much information as you can; later, you can analyze the material to separate the wheat from the chaff. 10. Usually, my psychic memory is quite short. Therefore, it's important that our session be tape-recorded. My answers then can be replayed repeatedly or transcribed in order to detect any information initially deemed unimportant or non-pertinent. 11. I do not claim to be 100% accurate in my perceptions. Nor do I claim to be able to work on all cases with an equal degree of effectiveness.